Volunteer, Tamahere weedbusters today donated their time to freeing new plantings from rampant weeds in the Tamahere Reserve. The volunteer group, co-ordinated by Jude Tisdall, are an offshoot of the Waikato Ecological Restoration Trust, which runs the Tamahere Community Nursery. Their three-hour weedbusting efforts released about 500 new plants from the strangling growth of pest invaders that threatened to overwhelm them. 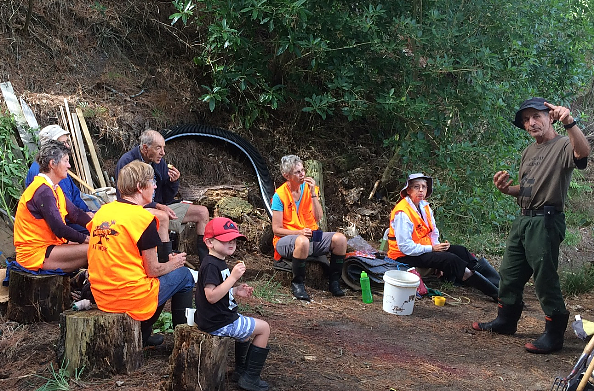 Tamahere weedbusters take a break to hear about the Tamahere Reserve from Leo Koppens, right. “The weedbusters were fantastic,” said Tamahere-Mangaone Restoration Trust spokesman Leo Koppens. “They were great workers and knew what they were doing. The group of eight volunteers, who donate their time once a month, spent about three hours weeding in the reserve’s wetland areas. Meanwhile, in a recent report to the Tamahere Commuunity Committee, Koppens outlined battles with other plants unwelcome in the reserve – the pines trees that dominate the upper slopes. “Despite four years of effort, the exotic pine trees are yet to be harvested,”he told the committee’s February meeting. “Every effort has been made to have them removed. The problem is simply that the Department of Conservation continually puts up barriers to granting a harvesting permit which is required by law. The stumbling point is protection of bat habitat, which may or may not exist among some of the pines. The reserve restoration trust asked for the committee’s support in seeking an operational grant from the Waikato District Council. “Several years ago the Tamahere Community Committee committed to supporting the reserve as the community’s major restoration project,” Koppens said. 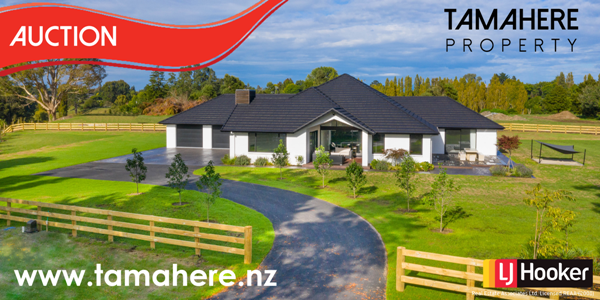 “Even in it’s partly restored state the reserve has justified that commitment as it is undoubtedly already an asset to Tamahere and can only be more so in the future. Told by council General Manager Service Delivery, Tim Harty, who attended the meeting, that WDC had no budget for ongoing operational budgets the committee resolved to try other funding methods. They included applying to the WDC grants committee, investigating a targeted rate for Tamahere residents that would cover the reserve’s operational budget, selling naming rights to the reserve, and requesting that the funds from the lease to Regal Group for the truck wash in the reserve be directed back to the reserve to fund the trust’s work.